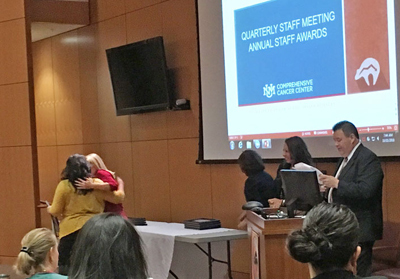 Congratulations to this year’s Staff Recognition Awardees! Back row, from left to right: Erica Williams, Bernadette Rodriguez, Alissa Aragon, Andrea Trujillo, Kathryn Kingsley, Kelly Votterro, Janet Vasquez, Arlene Purcella, Jill Mauldin, Meghann Brummett, Daniel Wesihampel, Amanda Leigh. Front row: Romana Barela, Sarah Grelle, Linda Jernigan, Karisa Glowinski, Tawny Boyce, Davina Santillan and Ashley Gilbert. Not pictured are: Angela Meisner, Brian Damazyn, Cesar Recio, Clebert Garcia, Jackie Benally, Jacqueline Rice, Loretta Esquibel, Marlena Ramsay, Melissa Gibson, Sara Sanchez, Veronica San Martin. Rodney Martinez, CFO, handed out the awards Oct. 11 to employees chosen from hundreds of nominations for 80+ employees. Be sure to congratulate this year's winners and thank them for their dedication and service.